the first African woman to be awarded the Nobel Peace Prize, has died of cancer at the age of 71, her family announced Monday. 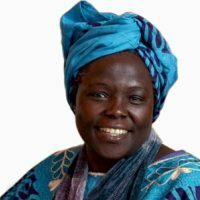 “It is with great sadness that the family of Professor Wangari Maathai announces her passing away on [Sunday] at the Nairobi hospital after a prolonged and bravely borne struggle with cancer. Her loved ones were with her at the time,” a statement on the Green Belt Movement’s website said. In 1977, Maathai – also the first woman in east and central Africa to obtain a doctoral degree and first woman professor at the University of Nairobi – founded the Green Belt Movement, a nongovernmental organization that married the two causes at the center of her work: women’s equality and stewardship of the land in her native Kenya. By training rural women to plant trees, Dr. Maathai hoped to give them greater control over their lives. In addition to contributing to their own economic independence by earning a few cents for each of the surviving trees that they planted, the women simultaneously were aiding in the fight to halt the deforestation and resulting erosion that was stripping bare entire swaths of Africa. Thanks to Wangari’s efforts, the Green Belt Movement has planted tens of millions of trees and was successfully initiated in neighboring countries, including Tanzania, Uganda, Malawi, Lesotho, Ethiopia, Zimbabwe and others, the Kenya Broadcasting Corp. said. In 2004 Maathai received the Nobel Peace Prize because her “unique forms of action have contributed to drawing attention to political oppression — nationally and internationally,” the prize committee said. She also received many other environmental, conservation and humanitarian awards. Following her death, which occurred on Sunday, tributes for Maathai – lauding her outstanding struggle against environmental degradation – poured in from around the globe.